Bleeding Heart is a common garden ornamental. 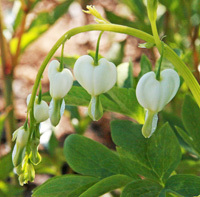 Valentine’s day brings hearts of all kinds, but in the Midwest you have to wait a little longer for the popular garden ornamental known as common or old-fashioned bleeding heart to come into bloom. 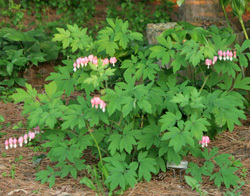 Dicentra spectabilis, native to eastern Asia (northern China, Korea and Japan), won’t start blooming until late spring. This perennial in the fumitory family (Fumariaceae) is hardy in zones 2-8. D. spectabilis was brought to England in 1810, but didn’t get established. It was introduced again after a Royal Horticultural Society plant exploration trip to the Far East in 1846, and soon it became a common garden plant. Some other less-common common names for this plant include Chinese Pants, Lady’s Locket, Lyre Flower, Our-Lady-in-a-Boat, and Tearing Hearts. 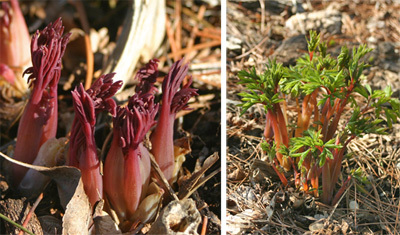 D. spectabilis emerges in early spring with red stems. 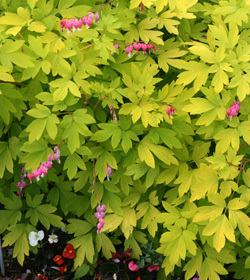 Dicentra spectabilis begins to senesce in summer, unless it’s cool and moist. he green to pink stems are very fleshy. 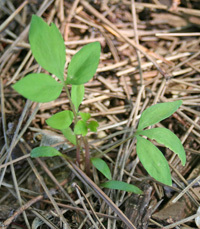 The powdery-green leaves are divided into three leaflets. Although they are attractive when not in flower, the plants usually start to senesce by August and go dormant in the summer. 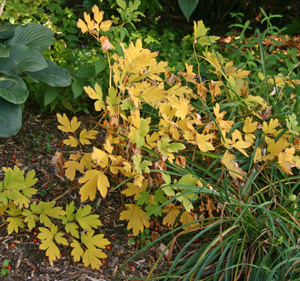 The leaves turn yellow and wither sooner in hotter or drier weather (but sometimes last through the season in cool, moist conditions). Cutting the plants back hard after flowering may delay senescence (as well as promote another flush of flowers). When the stems die back completely to the ground they can be pulled out and discarded. The unique 1-2 inch long, delicate-looking pendant flowers are vaguely heart-shaped. Each puffy bloom has two rose-pink outer petals and two white inner petals, with a white stamen protruding from the bottom. The pouched outer petals have strongly reflexed tips from which the inner petals protrude slightly. Flower buds (L); individual flower showing reflexed outer pink petals and white inner petals (C); and raceme with open flowers (R). Each inflorescence has several flowers dangling in a row in a one-sided horizontal raceme on the end of an arching, leafless stem. Plants flower from late spring to early summer, and the entire stems can be used for cut flowers, lasting up to 2 weeks in a vase. Flowers are followed by elongate seed pods. Plants will often self seed, but do not do so readily enough to be considered invasive. Bleeding heart grows best in light shade, although it will tolerate full sun in moist and cool climates. 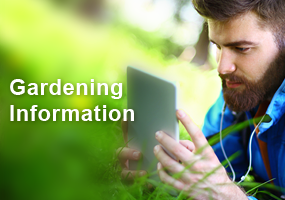 In most locations plants prefer morning sun and afternoon shade. 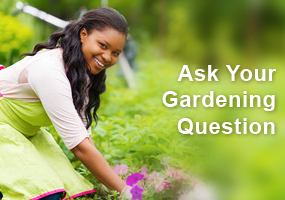 They also need well-drained soil and will rot if the soil remains too soggy. Humus-rich soil is best, but D. spectabilis will tolerate both clay and sandy soil if given proper moisture. Plant bleeding heart in light shade for best results. 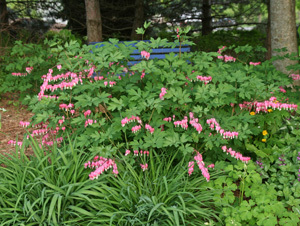 Use bleeding heart in cottage gardens, wildflower gardens and in shady spots throughout the landscape. These elegant plants work well in shaded borders and woodland gardens, but should be positioned so that other plants will obscure the dying foliage when the bleeding heart begins to senesce later in the season. 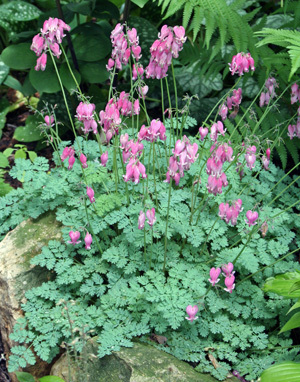 In a shade garden it can be combined with ferns, hosta, hardy geranium, and astilbe which come out later in the spring to fill in as the bleeding heart declines. Other ways to deal with such gaps include planting annual impatiens underneath, to grow up as the bleeding heart dies back, or placing containers with blooming annuals in the area after the foliage dies back. Bleeding heart has few pests, although aphids may occasionally infest particularly the inflorescences and slugs may feed on the leaves. Flowers of Dicentra spectabilis Alba. ‘Alba’ – with white flowers comes true from seed. This cultivar seems to tolerate summer heat better than the normal pink type, but is not as vigorous a plant. ‘Gold Heart’ – with bright golden-green leaves. Other species of Dicentra often grown as ornamentals include: D. exima, eastern or fringed bleeding heart, native to eastern North America, which grows only about a foot tall, with more finely divided leaves and smaller flowers; and D. formosa, western or Pacific bleeding heart, a northwest U.S. woodland native more suited to the climate there than in the Midwest. 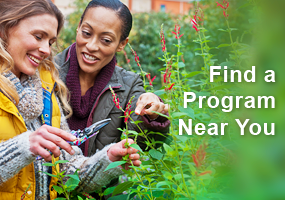 Both of these have a longer blooming season and retain their leaves through the growing season. Dicentra cucullaria, with flower closeup (inset). 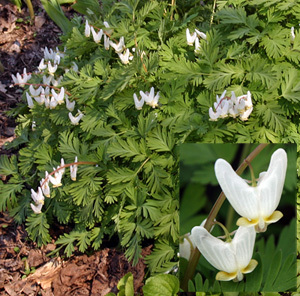 D. canadensis (squirrel corn) and D. cucullaria (Dutchman’s breeches), from eastern North America, are smaller species with white to yellow flowers that are suitable for woodland rock gardens or wild gardens. D. chrysantha (golden eardrops) reaches 5 feet tall and has bright yellow flowers, but is not common in cultivation as it does not grow well outside its native environment. 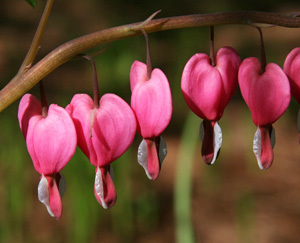 Bleeding heart is propagated by division in late fall or very early spring, or from fresh seed. Seeds are slow to germinate and require moist stratification. Self-seeded plants will bloom in 2-3 years if not disturbed (transplanting may delay flowering for another year or more, although plants can be moved easily).